My family and I are looking ahead to our fourth home purchase for our coming PCS. As with any of our real estate purchases, we’re approaching it cautiously. Trial and error experience has taught us to take some essential steps shortly after moving in to help make our homeowner experience a little easier. So, if you’re either preparing for your first home purchase or you’ve recently bought your first home, then I’ve got some easy hacks for first-time homeowners for you! Ideally, you’ll find a hack or two that’ll help put some cash back in your pocket either now or in the long-term. 1. Review your budget, and plan your mortgage pay-off strategy. No one knows strategy like a military family; use this to your financial advantage. I know this point probably sounds silly, I mean, you just signed a contract with a specified number of payments for either 15 or 30 years, right? Know, though, that you don’t need to take that entire period to pay off the home. If you signed for a 30-year mortgage, then you may want to consider creating an auto draft of an extra $200 a month (make sure to identify that it's to be applied to the principal balance only!) to help pay the balance down quicker. If you signed for a 15-year mortgage, then you may want to sign up for bi-weekly payments that coincide with pay day. This little switch in payment plans will mean that you make an additional month of payments over the course of a year, which can reduce your mortgage by approximately two entire years; you’ll pay it off in less than 13 years instead of 15! Alternatively, you may want to take your extra cash and put it in savings instead, so that you know that if you needed to make payments, you would have money in reserve. Check out our post on the great debate between the 15- and 30-year mortgage for more details on how to make this decision. 2. 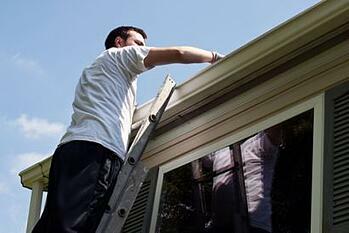 Create a list of contacts for home maintenance and repairs. Something in your new home will break. I promise I’m not jinxing your purchase; I just want to prepare you emotionally for the unpleasantness of having to find someone that you can actually trust to fix your poor broken baby when the time comes. Rather than waiting until your pipes burst to send out panicked requests on local Facebook groups for a referral to a trusted plumber, take the initiative to make your list in advance; otherwise, you’re just relying on whoever checks and responds to your post that day and hoping that they’re not just sending you the contact information of their buddy whom they think “does” plumbing. MilitaryByOwner spoke this week with Amy and Lauren over at Military Property Project about this maintenance referral issue that military families have in their new communities. It’s tough to find a reliable person to entrust with the care of your home when you’re new to a community. They shared with us a potential solution: They will soon launch Rolodex, a contact list of trusted home maintenance and repair techs created for military families by military families, complete with honest reviews and testimonies. 3. Save and organize your receipts. Any items bought for the home, such as furniture. This will help you with sales tax deductions. Any energy efficient items purchased, such as appliances. You won’t be able to deduct all of these, as the individual deductions can change annually, but at least you’ll have them organized so that you can easily see which items qualify. Any repairs completed. Repairs amount to a greater deduction when/if your property will turn into an investment rental, but keeping these receipts together will help with expense comparison in the event of future repairs. 4. Understand how your home works to help potentially save your life. Before you move into your home, first learn how to shut off power to your electricity, gas, and water systems. Don’t wait until you feel “settled” to ask the questions. Either take advantage of your final walk-through inspection or consider asking the inspector to show you how these systems operate. Most inspectors will gladly show you. It will not take you more than a few minutes to learn these critical homeownership safety measures that could help save your home, your money, or even your life. Stay tuned for future posts with more homeowner hacks, and if you’ve got your own that you’ve picked up from your experience, make sure to share them with your fellow first-time home buyer military families in the comment section below!